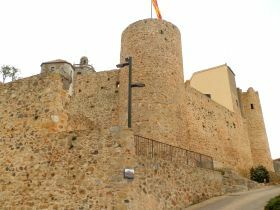 Llagostera literally stands above the roads that connect Girona and Barcelona to the Costa Brava and as such is one of the markers that the coast is not far away. Because of it's position at the head of the Aro valley, it is a town with a lot of history and interest, even though many people will just go straight past on the way to the coast, or back to the airport. We park on the Caldes de Malavella side at the bottom of the hill that leads to the castle. From this side, a steep road runs up to the top just outside the castle walls. The area has been restored and there are rings of streets that would have been part of the town walls. We're exploring at this point so our route is haphazard up and round in rings until we eventually take the stairs from a lower square up to the main castle and church level. Unusually there's a little bit of rain - normally even in winter we walk in dry conditions as it's unusual to have more than two or three days rain on the trot. The church is large and imposing with a Baroque facade standing in a large plaça that would have been the main courtyard for the castle with towers looking out from the hill top. The views are extensive along the dead straight road to Cassa de la Selva and on to Girona, or across to the hills of Gavarres and L'Ardenya. Our route down is also haphazard, turning when we see something that looks interesting, like a water fountain with a big handwheel to pump the water. 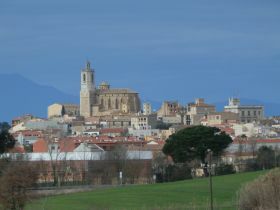 The town itself is quite large and well kept with many interesting buildings and practically a commuter town for Girona. The last time we were in Llagostera, there were people in home-made carts and buggies rolling down the hill from the castle in the annual cart-race which sees people dress up and make creatively decorated unpowered vehicles run down the streets. 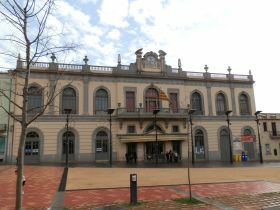 This time Llagostera is quiet and we only really see people as we walk past the old Casino social club - a 1920s building by the side of a large modern square. 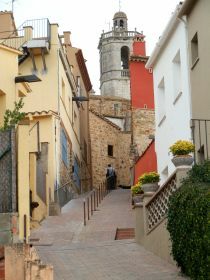 Heading out, we find the town rambla and then reach the outskirts and the route for the Carrilet - the viaverde bike route that connects Girona to Sant Feliu. We follow it north a little way to find our path out via the Mas Gottara estate and into the fields and farms. The road we're on turns to a dirt track and we head out towards the C35, stopping to admire the view from the low hill. Our path though, runs through a tunnel under the road and out towards an old Indiana-style estate house on the other side. The tunnel has a surprisingly long echo which entertains the children. We did want to get to see the state of the Indiana house - from the C35 dual carriageway (it's the arm that goes towards Barcelona) we pass this way and the house looks intriguing. Unfortunately the only way to approach it from our path is on a private road and we're discouraged from visiting by a neighbour in his garden. 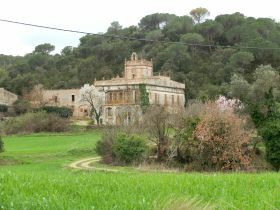 Instead, we continue on through the woods and past another enormous masia before reaching the road at the bottom. 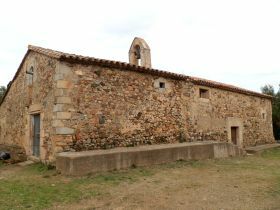 There's a little bit of a zig-zag here, we have to turn left, then right along the road looking for our next target - the chapel of Sant Llorenç. We pass a farm with sheep in the field - this is rolling farm country with a few wooded valleys in the distance. The chapel is on the small hill to our right and we find a small track that takes us up to the top. The chapel is more like an old stone barn with a bell on top so not so ancient but not particularly architecturally interesting. We take the track that runs down the hill from the chapel and then across the road to find our first signpost and we start to head back towards Llagostera. The rain has stopped and the day is brighter, but we follow a muddy track along the side of some woods with an enormous renovated masia complete with covered swimming pool to our right. We emerge back in the fields, but rather than continue towards Llagostera we go up the hill following the Carril Groc to see more views across Llagostera. Unfortunately the day is cloudy, but on a clear day we would be able to see the Pyrenees. 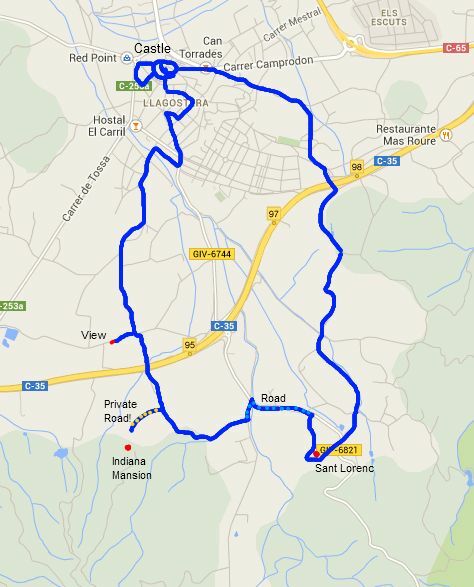 We then continue across the top of the hill, taking a left past a masia with a collapsable wind-turbine before rolling back down the hill to the road and a bridge back to Llagostera close to the access route to Mas Roure - a large restaurant that stands by the side of the dual carriageway. Still dodging the main town, we take the track up to the picnic area and then around the back of Llagostera to the main through road and back past the castle to the car.